Quantico: The Complete First Season DVD Review - Are You Screening? Quantico is one of those efforts that may suffer from its various connections to other shows – read: writers/producers whose previous work doesn’t necessarily see the value in avoiding melodrama at any point at all. The premise is an interesting one, and there’s nothing wrong with the highs and lows of throwing young-ish people into close quarters with each other, and you have to love feints-within-feints, but much of Quantico is constructed with a, “Well, if some is good…” theory in mind. Alex Parrish (Priyanka Chopra) is one of a group of recruits hoping to become FBI agents, and her own version of not being absolutely honest about why she’s there might have been enough, but before long Alex has been framed for a terrorist attack, and she’s got to figure out how to get out from under a thoroughly-planned setup… unless she did it. So spins the show… mostly. The show flips back and forth in time, from showing up as a recruit, to fast-forwarding nearly a year to the attack. Alex has to figure out who was involved, and looking back at her time as a recruit is going to be key. Thus, we get to look at all the unhidden mysteries of a gaggle of Type-As trying to sabotage each other, usually without quite looking like they’re making any such effort, and just as often hoping to mask their sociopathy. Most of this doesn’t make it any easier to figure out who might have had some connection to a terrorist attack. What the show manages to do surprisingly well is pull the audience into the truly curious question of ferreting out secrets from within a group of the most scrutinized people around, all of whom nevertheless have a fair amount to hide, and are being trained to hide it. It may dunk the idea in more pheromones than are necessary, and some of the characters aren’t offered the chance to develop beyond their stereotypes, but overall it’s a show that knows how to keep you guessing, and want to keep guessing. As the season continues, it begins to shine even more, just by keeping itself from falling into the ditch of all the layers it has to sell. Every answer leads to more questions, and there isn’t much to carry the whole thing along, beyond Chopra, who is holding her own in a nearly untenable position. With nearly too many plots to keep in the air at once, Chopra has to continually connect with the audience, even as things don’t go her way, which is a trickier bit of acting than people probably realize. It almost get to a point where every line of dialog has two meanings, as the plots swirl and dance. While the “steamy seduction” ABC wants to sell probably helps the ratings, it doesn’t exactly work any positives for the show in other ways, except that at least there’s (usually) a break from the endless back-stabbing and secret reveals. The set isn’t exactly loaded with bonuses, but it has some nice treats for fans. Welcome to Quantico is a short featurette that is almost “video diary” fare, as the cast and crew give something of a behind-the-scenes look at being behind the scenes, discussing their time on set, training, working with “twins,” and other bits of dialy life. It’s actually a pretty good piece, if you’re already a fan, though it doesn’t quite explore as much as you’ll probably hope. “Run” Video Commentary is another featurette, but with a bit of a twist, as it is a split-screen commentary with Creator Josha Safran and several of the stars. I’m not sure that this is where I want all commentary efforts to go, but this one was actually pretty good, and I’m not even in love with the show. This one seems to be a good example of the medium helping to create the product, because if you take in a lot of similar efforts, you’ll know that there’s a lot more going on here, and it’s easier for them all to break in. Who Did It? False Leads, Theories and Red Herrings is a pretty straightforward effort that simply has the cast reflecting on the fact that they didn’t know how the thing was going to end either, and the theories they had during production. It’s a fun idea, and good for a laugh. Finally, the release also includes Bloopers and Deleted Scenes. Take a look at a few special treats from the release below, and pick this one up. Television’s most riveting mystery unfurls against a backdrop of steamy seduction, maddening conspiracies and nerve-shattering suspense in ABC’s Quantico – The Complete First Season. People’s Choice Award winner* Priyanka Chopra stars as Alex Parrish, one of a diverse group of young recruits at the FBI Quantico Base. Despite intriguing personal secrets and complicated pasts, Alex and her fellow “NATs” (New Agents In Training) are the best, brightest, most thoroughly vetted candidates in the U.S., so it seems impossible that one of them could be a traitor. However, when Alex is framed for masterminding the most lethal attack on New York City since 9/11, she must race against time – and betray her closest friends and colleagues – to somehow identify the real culprit and prevent further carnage… because the bomber appears to be working from inside the Bureau. Revel in the thrill of the chase with all 22 action-packed episodes – plus captivating bonus features – that let you navigate the dangerous labyrinth of twists and turns that is Quantico. 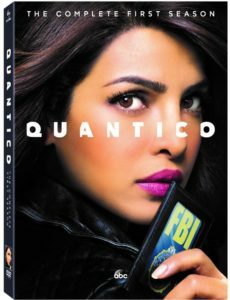 Cast: Priyanka Chopra as Alex Parrish; Yasmine Al Massri as Nimah Amin; Johanna Braddy as Shelby Wyatt; Tate Ellington as Simon Asher; Aunjanue Ellis as Miranda Shaw; Jake McLaughlin as Ryan Booth; Graham Rogers as Caleb Haas; Josh Hopkins as Liam O’Connor; and Anabelle Acosta as Natalie Vasquez.